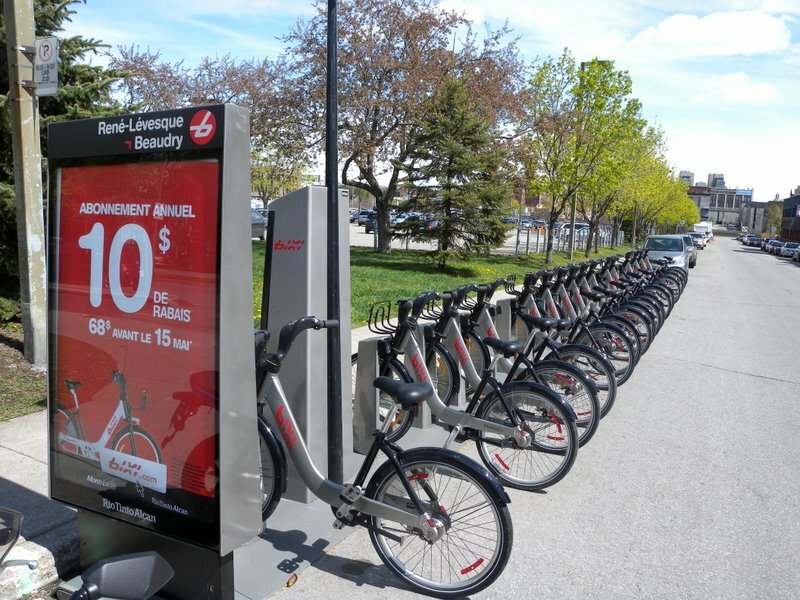 Urban planning, public transportation, and bicycling – three of my interests that are rolled into one in a Montreal-based bicycle sharing program called BIXI, short for BIcycle taXI. 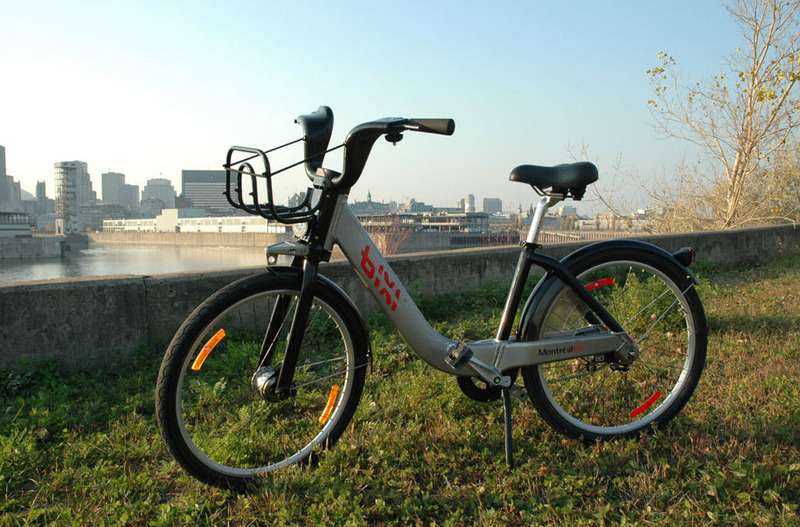 BIXI was introduced in June 2009, quickly growing to 5,000 bicycles. The one-millionth ride was taken in the first five months. Perhaps this is a model that we will see gain traction in other cities? Already, BIXI has expanded into Melbourne, Australia and Minneapolis, Minnesota – and London, England and Boston, Massachusetts are supposed to be online this summer. A system in parts of Washington, DC is scheduled to be on the way, too. Other cities around the world are installing similar systems. There is a bicycle rental program here in Bangkok, but it is only in the touristy section of the old city, designed for sightseeing, not transportation. I do ride my bicycle here, but since there are few places to park, I ride it mostly for exercise and not errands. Bicycling is an ideal way to get around for many of the errands we run or even for some of the distances we commute. Much of the year, the weather is fine, and bicycling is faster than walking. But one of the biggest obstacles is that we don’t want to lug our bicycle all over the place, especially if we need to travel by bus, train, or car for portions of the journey. Bicycle sharing programs eliminate the hassle. By providing a bicycle when and where you need it, you can easily integrate a bicycle into your overall transportation options. The system allows you to take a bicycle from wherever you are and leave it wherever you are going, without having to worry about bringing it back to your point of origin. A subscription program lets you rent a bike on the fly, free for the first thirty minutes, or you can pay as you go. The bicycles are durable and designed to keep you from getting messy – chain guards and fenders keep the oil and puddles off you. A handy basket lets you carry your belongings with you and even pick up a bag of groceries or other small items. Best of all, in my opinion, is their convenience. This map of most of Montreal shows how densely located the BIXI bike stations are. They are everywhere – usually within a block of where you are! Especially when tied into transit systems like bus and train lines and large car parks, the bike sharing system makes it easy to switch to a secondary mode of travel, one that is better for you and for our environment. If you would like more information about BIXI, you can click here. For more information about bicycle sharing systems in general, here is the Wikipedia article. Sorry if this sounds like a marketing brochure – I just think BIXI sounds like a cool idea that should be the standard rather than the exception in more cities. This entry was posted in Uncategorized and tagged Bicycle, Bicycling, Design, Montreal, planning, Sharing, transit, transportation, urban by christao408. Bookmark the permalink. Several European cities have this, e.g., Paris or Vienna. But the density of the BIXI outlets in Montreal is impressive. I like this system. How come I didn’t see BIXI when I was in Montreal? Oh, never mind. It was introduced in 2009. I think that’s a great idea. More places should have it! Delhi has a similar service too… but as much as I loving cycling, I haven’t used it yet. Though there are dedicated cycle lanes on most of the roads where this service is available, you know how India works- the lane meant for cycles have motorbikes and sometimes even auto-rickshaws invading; in effect making it practically unsafe. Great Idea – it would be most practical here (Florida) with all the flat land. i think it’s a great idea, but i wonder how many people are going to use it? this also requires a bike-friendly city, with plenty of bike lanes so that bikes aren’t forced onto the sidewalk to terrorize the pedestrians or so that they don’t have to weave between the cars and slow down traffic. at any rate, i don’t think i would make use of this service…. i don’t really know how to bike. Not of great use to me… Don’t know how to ride a bike. Period. But the concept is great. I think it will take off all over the world. More and more people are so much into exercise and trying to get away from paying the hefty price for gasoline, so Bixi might be it. We have a small bike share here in DC now but it doesn’t seem to be that widely advertised or even available in convenient places. That’s nice.It takes quite a bit of public education to make this work so people don’t steal the bikes. @Redlegsix – @yang1815 – You use your credit card either to buy the subscription or to rent on an as-needed basis. A $250 hold is placed on your credit card until the bike is returned. I’m not sure what the process is, but I suspect they try to get hold of you after 24 hours and if you don’t respond, you’ve bought the bike. Theft shouldn’t be much of an issue. Kind of like the luggage cart machines at the airport, you can’t pull them out until they are paid for. @murisopsis – What a great idea! Which school is it? @kunhuo42 – @ZSA_MD – Hmm… first things first, we need to teach the two of you how to bicycle. @amygwen – Have a happy birthday. Go for a bike ride! @Fatcat723 – Florida would be a good place, wouldn’t it? @Dezinerdreams – I hear you, brother. Just like Bangkok. @Roadlesstaken – It is coming your way… stay tuned. @foggysunnymorning – And there’s your answer! =D@moolgishin – @beowulf222 – Certainly many other cities have done similar things. This was the first major install in a North American city, which I found impressive. Of course, Montreal is probably the most European of the North American cities, so no surprise there. @TheCheshireGrins – Part of the same system, although they are using another name. Just started in the past month or two, I think. *sigh* I should have learned how to ride a bike. I suppose I could learn now… If they were available in my area, I would. Yes my hometown rocks. Thank you very much. @christao408 – St. Mary’s College. I’ve used the Bixi bikes in Montreal and also in Ottawa, and it’s brilliant. The stands are, as you say, all over so you can easily take a bike at work, ride it home and leave it there.The one drawback and something they are trying to address in Montreal is that they don’t rent bike helmets with the Bixis, and there has apparently been a significant increase in head injuries in Montreal since the program began. To me, the solution is to carry my own helmet, but it is a serious concern that they want to fix. So just an FYI. Great post. A great idea, but cycling is not something I’m able to do now, unless it’s an ‘electric’ bike that helps you get up hills. I think Toronto has something similar. It’s not a very bike friendly city as a lot of drivers are somewhat ignorant of cyclists. @ElusiveWords – But Toronto is relatively flat with the exception of a few areas, right? And with the transit network, it would seem like bicycling there would be pretty convenient. @Chatamanda – Those exist and wouldn’t be a bad idea@Wangium – SF was always a challenge when I was biking there. I would pour over my SF Bicycle Coalition map, the one that shades each block of the city in various shades of pink or red to indicate the elevation gain, trying to map out the least strenuous route. @AppsScraps – Too bad it isn’t attracting more interest. As I replied to Matt, I would think TO would be a relatively bicycle friendly city. @sorrybabydoll – There’s the incentive you need to learn! =D@agmhkg – It wasn’t that long ago, was it, that nearly ALL of China was about masses of bicycles rather than masses of cars? My, how things change. @jenny – I read about that on the BIXI website – several deaths recently. I guess one needs to carry a helmet with them, which is certainly not the most convenient thing. I love that idea. I miss having a bike. It would be a more fun way to exercise than using my just acquired push lawn mower! @Gma_Joyce – I suppose if you take your mower to other parts of the city and mow other people’s lawns, you would get both the exercise and the change of scenery that bicycling offers! Just a suggestion… Ha ha! @christao408 – You have a wicked sense of humor, Chris! Remember I’m 78 years old and weather here has been in the 90’s. I think I’ll pass on that suggestion, honey….especially since I want to live to see 79. @Gma_Joyce – Good point. Perhaps leave the volunteer mowing to the scouts. BIXI is so wicked…we were in Montreal a couple weekends back and considered taking renting them but we just walked instead. 🙂 I wish Toronto had it but our city is just not made for cyclists. @christao408 – Given my knowledge of Toronto politics, I am very cynical that this will actually happen!